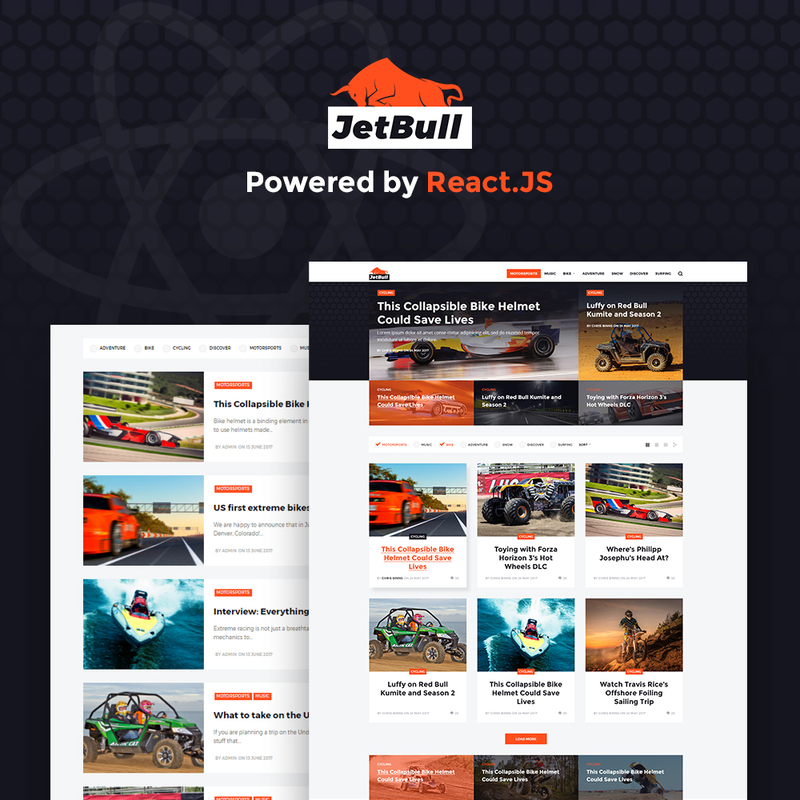 If you're looking for a high-quality extreme racing WordPress theme, this well-documented JetBull is your match! Being fully responsive and crossbrowser compatible, it allows you to build a professional-looking website that will show up brilliantly on any modern device and in any browser. Crafted with a new Jet Elements technology, this racing WordPress theme boasts a flashing sort option, an extremely fast filtering and posts' loading process, and more! So, you can create a reactive website on the fly! JetBull has a truly clean look, therefore, nothing will distract your visitors from getting to know with cool and adventurous extreme racing. Built with Power, this action sport theme provides you with a code-free website building. Meanwhile, a WordPress Live Customizer allows you to edit your website in a real-time mode. A neat newsletter subscription allows your site's visitors to stay informed of all upcoming racing events, meanwhile, a wide range of social options allows them to share their impressions on the social media. What's more about JetBull? Hit the demo to see the full set of its features! I would like to make payment for WordPress theme for Car Corporation by company check. Is that possible? After WordPress theme for Car Corporation purchase you can put your copyright to the template. But you cannot place a line at the bottom (or any other spot) of the customized project saying "Website design by Company name". Nevertheless, you can place "Customized by Company name". If you purchase the product at a â€˜Buyout price' it guarantees that you are the last person to buy this template from us. It means that this Karting WordPress theme may have been sold before a couple of times (see â€˜Downloads' number in item's properties) but only you and people who bought the template before you will own it. After this kind of purchase the template is being permanently removed from our sales directory and is never available to other customers again. The buyout purchase license allows you to develop the unlimited number of projects based on this template, but the template should be customized differently for every project. If you purchase the product at a â€˜Unique price' it guarantees that you are the first and the last person to buy this WP theme for Car Racing Portal from us. It means that this template has not been sold before and you become an owner of a unique design. After this kind of purchase the template is being permanently removed from our sales directory and is never available to other customers again. The unique purchase license allows you to develop the unlimited number of projects based on this template, but the template should be customized differently for every project. Single Site License $59 Single Site License for the template grants you a non-exclusive permission to use the template on a single domain/project.